The effects of climate change have forced people like Naomi to make gravel to make ends meet. Men and women, from the young to the elderly, all engage in this backbreaking work. Naomi steps into the quarry, picks large pieces of stone, climbs out, and seeks a spot to begin the arduous task of breaking up the rock. Fine dust envelopes her as she works. At noon, Naomi downs her tools and heads home to prepare lunch. Afterwards she swaps her stone-crushing mallet for a hoe and watering can, and heads to her farm. Here, among her acre of land, is where Naomi is at her happiest. She begins to plough, weed and till, caring for her crops and vegetables. The money raised for our appeal helped Naomi attend a farmer field school set up by our Church partner, one of many started in countries across the world. 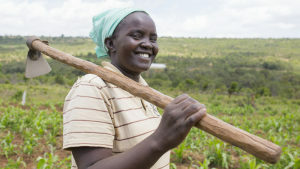 “They trained us on farming techniques that we can adopt in this harsh climate, so we can earn a living from farming,” Naomi says. Naomi was given a hoe, a watering can and a shovel and trained in how to use manure to increase yield and line planting to space out crops. Naomi has already put this into practice on her farm where she’s planted crops including maize, beans, potatoes. This support for Naomi was possible thanks to funds raised through CAFOD’s Lent appeal two years ago. Catholic communities across England and Wales raised £5 million for the 2015 appeal, which was matched pound for pound by the UK government through the UK Aid Match scheme. This funded farmer field schools and training not only for Naomi’s community, but for more than 16,000 rural farming families across Kenya, Bangladesh, and Zimbabwe. In addition to the training, farming machinery was provided, irrigation installed, livestock bought ready to breed and weather monitoring training set up, which by summer 2018 will have helped a total of 450,000 men, women and children to become more resilient to the changing climate. For Naomi, the support she has received has spurred her on to engage other women in the community. She has been able to bring together 20 local female volunteers to be part of a chicken project. Caritas Maralal donated five cockerels and each of the women gave a chicken. Caritas Maralal supported with chicken coops, feed and water troughs and once the project becomes commercially viable, there are plans to assist the women with selling the eggs at market. By summer 2018, you will have helped 450,000 men, women and children to become more resilient to the changing climate. Thank you.